How can you make highlighted code more readable in Visual Studio 2010? If you do as many demos as I do, you will want to make sure that your delegates can follow and understand everything that you are trying to show them. If you are showing them code such as C# or VB.NET and highlighting segments to emphasise a point, trust me they can’t read it! Of course this all depends on the quality of your projector and the size of the projected image but in the typical training room where the image is perhaps 8 feet wide, you will be lucky if anyone further back than 15 feet (that will be the second row then!) will be able to read any code that you have highlighted. Even if you zoom in to enlarge the code ("you do know about [Ctrl] [mousewheel] don't you? "), most people are unable to read the code. So before you start the course/presentation, make sure you configure Visual Studio 2010/2011 properly. 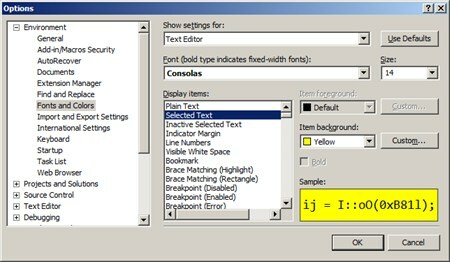 From the Tools / Options menu select Environment then Fonts and Colors. Now change the Selected Text property to Yellow. As follows. In fact while you are there, why not set your font size to 14? 10 is too small and you never know when you are asked to manage without a mousewheel! That's it. Whenever you highlight an important piece of code from now on, your delegates will actually be able to read it. Now that can't be a bad thing can it ?